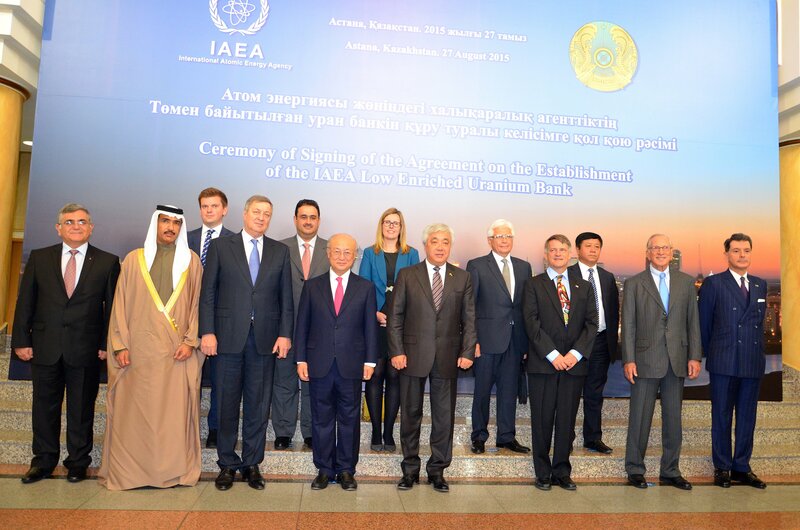 On August 27, the International Atomic Energy Agency (IAEA) and Kazakhstan signed an agreement establishing a fuel bank of low-enriched uranium (LEU). The ceremony in Astana, Kazakhstan’s capital, marked a milestone in the progress of an initiative on facilitating access to nuclear energy and strengthening nonproliferation that originated more than a decade ago. The LEU bank is to be located at the Ulba Metallurgical Plant at Öskemen (formerly Ust Kamenogorsk) in Kazakhstan. It is to be owned and operated by the IAEA as part of the agency’s effort to provide assurances of nuclear fuel supply. Nuclear power has been a key part of the world’s electricity supply for more than 50 years and will continue to be one of the lowest emitters of carbon dioxide among energy sources through the entire life cycle. Like other energy sources, nuclear energy has advantages and drawbacks with regard to its impact on the environment and its social and economic dimensions. According to the IAEA, global expansion in nuclear power generating capacity is projected to expand.4 Today, 30 countries use nuclear power generation, and this number is likely to increase in the next couple of decades. There are 438 nuclear powers reactors in operation currently, providing about 11 percent of electricity generated globally. Global uranium-enrichment capacity presently exceeds total annual demand, but with the projected increase in reactors, enrichment capacity will need to increase. Currently, commercial enrichment is carried out in China, France, Russia, and the United States and by Urenco,6 which has plants in Europe and the United States. Small-scale enrichment facilities are operating in Argentina, Brazil, India, Iran, Japan, and Pakistan. Assurance-of-supply mechanisms such as the LEU bank are designed to be a backup to any disruption in commercial supply of LEU for nuclear fuel for existing and new users of nuclear power, thus contributing to confidence in nuclear energy while minimizing potential proliferation risks by avoiding the construction of new enrichment facilities. In September 2006, the co-chairmen of the Nuclear Threat Initiative (NTI), former U.S. Senator Sam Nunn (D-Ga.) and Ted Turner, offered $50 million from NTI adviser Warren Buffett to help create an IAEA-owned and -operated LEU bank on the condition that the IAEA raise $100 million from other sources for that purpose.7 To provide a location, Kazakhstan offered to host the IAEA fuel bank.8 By May 2009, the IAEA had received funds and pledges in excess of $100 million9 from the European Union, Kuwait, Norway, the United Arab Emirates, and the United States, thus meeting the NTI funding criterion. On December 3, 2010, the IAEA Board of Governors approved the establishment of the LEU bank10based on the following criteria: (1) LEU supply to a nuclear power plant is disrupted; (2) the recipient state is unable to secure LEU from the commercial market, by state-to-state arrangements, or by any other such means; (3) the state has in place a comprehensive safeguards agreement with the IAEA and is in compliance with this agreement; and (4) the state has concluded a supply agreement with the IAEA and has paid the full cost to replenish the supplied LEU from the bank. The board and IAEA member states emphasized that the additional options for assurance of supply will supplement the rights that exist under Article IV of the nuclear Nonproliferation Treaty (NPT) to use nuclear energy for peaceful purposes and will not limit states’ nuclear-fuel-cycle choices. Host state agreement. Negotiations between the IAEA and Kazakhstan on a host state agreement governing the establishment and operation of the LEU bank were unduly protracted and took nearly three-and-a-half years due to the inexperience of the IAEA Secretariat and Kazakhstani authorities, as well as the demands of the IAEA. The agreement was finalized in January 2015, approved by Kazakhstani authorities in May, approved by the IAEA board in June, and signed by representatives of the two parties at the Astana ceremony in August. The agreement is valid for 10 years and comprises 19 articles. It defines the fuel bank as the physical stock of IAEA LEU located at the IAEA LEU Storage Facility. The LEU will be stored in up to 60 industry-standard cylinders for enriched uranium hexafluoride. Kazakhstan will lease the storage facility to the IAEA for a token charge of one euro annually, and Kazakhstan will cover costs relating to the implementation of safeguards in connection with the bank. The bank will be the property of and under the jurisdiction and control of the IAEA. The technical staff of the Ulba plant will be able to enter the facility without advance IAEA permission only in the event of an emergency or hazard or threat requiring urgent action. Emergency preparedness and response, as well as safety, security, and safeguards, will be the responsibility of Kazakhstan. For the purpose of applying safeguards, Kazakhstan is to establish an LEU storage facility separate from the facilities at the Ulba plant. The fuel bank is to be safeguarded at all times against natural and other hazards; unauthorized removal or diversion; damage or destruction, including sabotage; and forcible seizure. All questions concerning civil liability for nuclear damage are to be governed by the Protocol to Amend the Vienna Convention on Civil Liability for Nuclear Damage, to which Kazakhstan is a party. “Flags.” It has always been recognized by the IAEA Secretariat that, for the LEU bank to provide a credible assurance of supply, the nuclear material acquired by the agency should not require the consent of the supplier state for the agency to provide the nuclear material to a member state as long as the arrangements between the IAEA and the recipient state were in accordance with the criteria approved by the board for such transactions. Accordingly, in 2009, ElBaradei stated that the agency would purchase the LEU using its standard procedures for open tender from vendors willing and able to provide LEU or its components—natural uranium, conversion, and enrichment services—free of conditions that conflict with the purpose of the establishment of the fuel bank.11 This meant that the IAEA would be able to supply LEU from the bank to member states without the prior consent of the supplier. Subsequently, some supplier states suggested that it would be necessary to uphold the obligations attached to nuclear material acquired by the agency and that the IAEA would need to respect the obligations, such as the need by the IAEA to obtain the supplier’s consent when providing the LEU to a member state. The secretariat objected to this insertion of conditions, known as “flags,” and insisted that the assurance of supply provided by the fuel bank would be implemented by the secretariat solely in accordance with the provisions of the Statute of the IAEA, as well as any relevant stipulations of the board. The secretariat said the IAEA would acquire LEU for the bank without any conditions that conflict with the purpose of the establishment of the IAEA LEU bank—that is, credible assurance of supply. • The recipient state has a comprehensive safeguards agreement in force with the IAEA. • The agency has drawn a conclusion on the nondiversion of declared nuclear material for the state in the most recent Safeguards Implementation Report, and there currently are no issues relating to safeguards implementation regarding the state under consideration by the IAEA board. • The supplied LEU shall be used by the state exclusively for fuel fabrication for the generation of energy at the power plant experiencing disruption of fuel supply and shall remain at the power plant unless the state and the IAEA have agreed on a different location. • The supplied LEU and any special fissionable material13 produced through its use, including subsequent generations of produced special fissionable material, shall be stored or reprocessed or otherwise altered in form or content by the state only on conditions and in facilities agreed with the IAEA. • The supplied LEU shall not be further enriched, retransferred, or re-exported by the state unless agreed with the IAEA. • The supplied LEU shall not be used by the state for the manufacture of any nuclear weapon or any nuclear explosive device, for research on or the development of any nuclear weapon or any nuclear explosive device, or in such a way as to further any military purpose. • The safeguards rights and responsibilities of the IAEA provided for in Article XII.A of the Statute of the IAEA, regarding safeguards and noncompliance, are applicable to the supplied LEU and shall be implemented and maintained by the IAEA. • Article XII.C of the IAEA Statute, regarding the reporting of noncompliance to the UN Security Council, shall apply with respect to any noncompliance with the provisions of the supply agreement. • The applicable IAEA safety standards and measures are to be followed by the state for the transport, handling, storage, and use of the supplied LEU and for the operation of the power plant. • Adequate physical protection measures shall be maintained by the state with respect to the supplied LEU, in accordance with the applicable IAEA fundamentals and recommendations. Thus, the conditions required by the IAEA to be accepted by a member state requesting LEU from the IAEA fuel bank are more stringent and comprehensive than any national export controls and the guidelines of the Nuclear Suppliers Group. In addition, the agency must buy LEU or its components only from sources that will accept the IAEA flag and will not insist on their own national flag. Furthermore, the LEU or its components acquired for the fuel bank will need to be free of any previous unresolved commercial disputes or other burdens that could in any way impair or affect the purposes of the bank. Profile of the LEU. The LEU will be stored in standard steel cylinders, which are 30 inches in diameter and have a capacity of about 62 kilograms of uranium enriched to 5 percent. LEU does not deteriorate and can be safely stored for many years. It is a white-gray, waxy solid during storage and transport. It is not nuclear waste, nor is any waste generated by simply storing it. Thus, it has no adverse environmental impact when properly stored in certified cylinders. With open-source nuclear industry data, the notional or illustrative requirements can be estimated for enrichment levels and quantities of LEU required for reloads for the safe operation of the main types of power reactors currently in operation or under construction in non-nuclear-weapon states (tables 1 and 2). 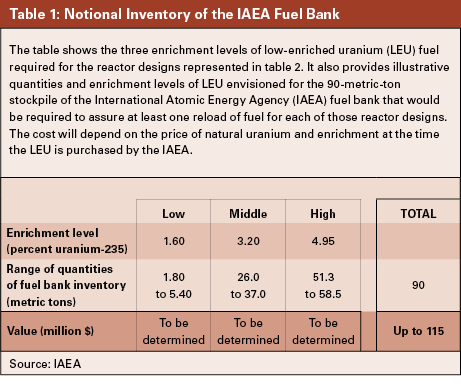 To provide the IAEA fuel bank with minimal capacity to assure at least one reload for each reactor design currently on the market, the projected 90 metric tons of LEU in the bank notionally could contain the following ratio of quantities of LEU at three different enrichment levels: from 51.3 to 58.5 metric tons with U-235 assay of the highest enrichment level of 4.95 percent, from 26.0 to 37.0 metric tons with U-235 assay of middle enrichment level of 3.20 percent, and from 1.80 to 5.40 metric tons with U-235 assay of low enrichment level of 1.60 percent, for the combined total of about 90 metric tons. Thus, the three enrichment levels and the related quantities of LEU at those enrichments should be able to supply the broadest range of reactors achievable. LEU procurement and acquisition. The IAEA fuel bank project will involve the procurement, acquisition, and delivery of the LEU, as well as storage cylinders and transport overpacks, costing at least $130 million. This will be the largest single procurement in the agency’s history and its first procurement of significant quantities of enriched uranium. As the agency’s external auditor cautioned in 2011, this venture poses high risks to the agency. Because of the factors noted above, in particular flags or consent rights, and the IAEA’s status as an international organization, the logical and safe option would appear to be that of buying LEU or its components directly from the governments of member states. This would assure accountability, quality control, and supply of LEU in accordance with the IAEA statute and the decision of the IAEA board on the establishment of the bank. Other potential options could include buying the material from uranium-enrichment companies, nuclear power utilities, or traders and brokers. Options for buying from sources other than member states would pose major risks and uncertainties regarding liens, liability, corruption, and the ability to supply LEU free of flags or consent rights. In the technical briefings to member states on the LEU bank, it appears that the secretariat has not given the board detailed financial and administrative plans or provided any detailed information on the agency’s plans for LEU procurement and acquisition. For its part, the board has not exercised the required direction on governance and accountability. Given the importance of the IAEA fuel bank and the magnitude of funds involved, the donor states, the EU, and the NTI should call for full disclosure of the complete administrative, financial, and procurement plans related to the bank. As this project is funded solely by extrabudgetary funds rather than monies from the regular IAEA budget, the donors are well within their rights to demand and to receive full and complete information on all aspects of the establishment of the bank. LEU delivery requirements. A key element in the establishment of the fuel bank is to minimize the risk to the agency of civil and nuclear liability, loss and damage, and transportation-related risks in connection with the handling and transport of the LEU. The agency will not be in a position to cover such liability and risks adequately or to defend itself against claims brought by nonstate parties. The need to avoid such risks is not unique to the agency. Many utilities and other customers of nuclear material routinely sign contracts for their supplies on the basis of “delivery at point” or “delivered duty paid”—that is, delivery of the nuclear material by the supplier to the buyer’s site, thus consigning all transport and delivery risks to the supplier. This is a well-established practice under International Commercial Terms20 of the International Chamber of Commerce. This is not merely a commercial consideration but an essential requirement inherent to the technical specifications for the fuel bank that the IAEA takes ownership of the LEU only at the Ulba plant, the location of the bank, and the supplier is responsible for LEU handling and transport, including safety and security, from the initial point of supply to the destination, the bank site. During storage of the LEU at the Ulba plant, liability is to be covered by insurance taken out by the IAEA and Kazakhstan. The recipient state must take ownership at the Ulba plant of any LEU supplied from the bank by the IAEA and would be responsible for onward transport of the LEU and for liability. Under such an arrangement, transport and liability become the responsibility of the recipient state at the handover point at the Ulba plant. The objective is to minimize IAEA liability. Similar logic will be applied to the delivery of LEU to the IAEA by Russia at the seaport of St. Petersburg from the IAEA guaranteed reserve at Angarsk and subsequently from the IAEA to a recipient state. Transit agreements. As a landlocked country in the steppes of Central Asia, Kazakhstan is dependent on Russia for land transport of its nuclear exports and imports. The rail route to the seaport of St. Petersburg, the nearest port, is several thousand kilometers long. Another rail route, to the Chinese seaport of Shanghai, apparently is under consideration. Transport of nuclear cargoes has to be properly licensed and carried out under internationally recognized safety and liability requirements. On June 18, the IAEA and Rosatom, Russia’s state nuclear corporation, signed a transit agreement for the transport of LEU through Russian territory to and from the fuel bank in Kazakhstan. Rosatom will be the executive authority to implement the transit agreement and is obligated to ensure the safe, secure, and timely delivery through Russian territory of IAEA-owned LEU. The LEU cargo would be immune from any form of interference and free of any restrictions and taxation by Russia. More than a half century after Eisenhower articulated his vision for the IAEA, there finally were concrete steps toward realizing that vision. An IAEA LEU reserve was set up in March 2010 at Angarsk, the United Kingdom’s government-to-government Nuclear Fuel Assurance took effect in March 2011,21 the United States’ American Assured Fuel Supply22 came into force in August 2011, and the IAEA fuel bank in Kazakhstan is expected to be operational in 2017 when it receives its stock of LEU. These achievements together mark the evolution of a new framework for the utilization of nuclear energy that supports the exercise of the “inalienable right” of all states-parties to the NPT to develop and use nuclear energy for peaceful purposes, as acknowledged in Article IV of the treaty, and strengthens nonproliferation measures with regard to the sensitive parts of the nuclear fuel cycle. Although a host state agreement and a transit agreement have been concluded for the IAEA fuel bank, major challenges lie ahead. Originally, it was envisaged that the bank would be functional by the end of 2014, but now the expected start date is 2017 or even later. That could mean the effort would span the terms of three directors-general: ElBaradei until 2009; Yukiya Amano, the current director-general, whose term ends in 2017; and Amano’s successor, who will take office in December 2017. The fuel bank will be an important accomplishment for reliance on nuclear energy and for nonproliferation with respect to enrichment facilities. To avoid squandering this impending victory, however, the IAEA and its member states need to refocus on the original mandate of the IAEA statute and the fuel bank. The purpose of the bank is to serve as an insurance mechanism to back up the commercial market in nuclear fuel. Its three reloads’ worth of LEU will not distort the market as more than 380 reloads are provided annually by the market. As the project now is well into implementation, the secretariat should exercise extra care in avoiding excessive complication, overstaffing, bureaucratization, poor managerial control, and extended timelines for completion. Donors to the LEU bank need to exercise stricter oversight of cost control, project management, financial accountability, procurement, and oversight and may even consider calling for an audit of the project by an independent team of technical and management experts drawn from nuclear energy ministries, regulators, and industry. States considering supplying LEU to the IAEA for the bank must not insist on prior consent rights, but should agree to accept the IAEA criteria for governing the supply and use of fuel from the bank. Donations of LEU to the IAEA also could be considered. For example, under the agreement signed in Vienna on July 14 by Iran and six world powers—China, France, Germany, Russia, the UK, and the United States—Iran agreed to reduce its existing stock to less than 300 kilograms of uranium hexafluoride enriched up to 3.67 percent U-235 and to sell or down-blend the remaining quantities. Iran could take the high road to further demonstrate its good faith by donating its LEU or selling it at a discounted price to the IAEA for the fuel bank. Should Iran decide to do so, the IAEA and its member states should accept the offer promptly. The LEU could be stored temporarily at the IAEA LEU reserve at Angarsk until the bank facility at Ulba is operational. That would enable Iran to meet the agreement’s timeline for reducing its stock. Finally, as discussed above, in the context of an expected rise in demand for enrichment, existing assurance-of-supply mechanisms already contribute to addressing vulnerabilities in the supply of nuclear fuel for nuclear power programs while reducing possible nuclear proliferation risks by obviating the needs for additional new national enrichment capabilities. In a world with perhaps 500 or more nuclear power reactors by 2030, it would be inadvisable to have dozens of countries with enrichment programs. The IAEA LEU bank will further bolster assurance of supply. Thus, states would not need to have a complete nuclear fuel cycle to ensure adequate supplies of fuel for their nuclear power programs. In the end, true security regarding the sensitive parts of the nuclear fuel cycle can come only through the multilateralization of all uranium-enrichment and plutonium-separation facilities, buttressed by a multilateral, verifiable treaty prohibiting the production and stockpiling of weapons-usable nuclear material. 1. Papers of the Presidents of the United States: Dwight D. Eisenhower, 1953 (Washington, DC: Government Printing Office, 1960), pp. 813-822. 2. “Curbing Nuclear Proliferation: An Interview With Mohamed ElBaradei,” Arms Control Today, November 2003; Tariq Rauf and Fiona Simpson, “The Nuclear Fuel Cycle: Is It Time for a Multilateral Approach?” Arms Control Today, December 2004. 3. 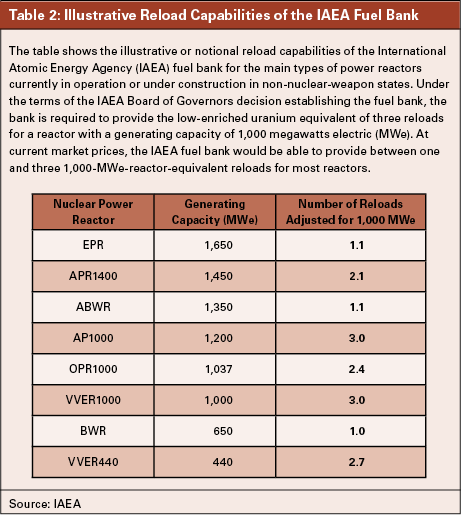 Tariq Rauf and Zoryana Vovchok, “Fuel for Thought,” IAEA Bulletin, No. 49-2 (March 2008), https://www.iaea.org/sites/default/files/49204845963.pdf. 4. International Atomic Energy Agency (IAEA), “IAEA Sees Global Nuclear Power Capacity Expanding in Decades to Come,” September 8, 2015, https://www.iaea.org/newscenter/news/iaea-sees-global-nuclear-power-capacity-expanding-decades-come. 5. Nuclear Energy Institute, “FAQ About Nuclear Energy,” n.d., http://www.nei.org/Knowledge-Center/FAQ-About-Nuclear-Energy. 6. Urenco is jointly owned by the Dutch government, the UK government, and two German utilities. 7. Nuclear Threat Initiative (NTI), “NTI Commits $50 Million to Create IAEA Nuclear Fuel Bank,” September 19, 2006, http://www.nti.org/newsroom/news/nti-commits-50-million-iaea-nuclear-fuel-bank/. 8. IAEA, “Communication Dated 18 May 2009 Received From the Permanent Mission of Kazakhstan to the Agency Enclosing a Position Paper Regarding the Establishment of IAEA Nuclear Fuel Banks,” INFCIRC/753, May 19, 2009; IAEA, “Communication Dated 11 January 2010 Received From the Permanent Mission of the Republic of Kazakhstan to the Agency Enclosing a Position Regarding the Establishment of IAEA Nuclear Fuel Banks,” INFCIRC/782, January 15, 2010. 9. The European Union contributed 25 million euros; Kuwait, $10 million; Norway, $5 million; the United Arab Emirates, $10 million; and the United States, $49.5 million. See IAEA, “Assurance of Supply: Proposal for the Establishment of an IAEA Low Enriched Uranium (LEU) Bank: Report by the Director General,” GOV/2009/30, May 20, 2009, para. 5 (hereinafter 2009 IAEA assurance of supply proposal). 10. IAEA, “Assurance of Nuclear Fuel Supply,” GOV/2010/70, December 3, 2010. 11. 2009 IAEA assurance of supply proposal, n. 9. 12. IAEA, “Request by the Russian Federation Regarding Its Initiative to Establish a Reserve of Low Enriched Uranium (LEU) for the Supply of LEU to the IAEA for Its Member States,” GOV/2009/76, November 11, 2009, art. I(2), art. I(8); IAEA, “Assurance of Supply: Establishment of an IAEA Low Enriched Uranium (LEU) Bank for the Supply of LEU to Member States,” GOV/2010/67, November 26, 2010, attachment 1 (articles III and VI of the “Model Agreement” between the member state and the IAEA in order to obtain LEU from the agency) (hereinafter 2010 IAEA assurance of supply establishment document). 13. Special fissionable material is defined by the IAEA as “plutonium-239, uranium-233, uranium enriched in the isotopes 235 or 233, [or] any material containing one or more of the foregoing.” IAEA, “IAEA Safeguards Glossary, 2001 Edition,” International Nuclear Verification Series, No. 3 (June 2002), p. 30, https://www.iaea.org/sites/default/files/iaea_safeguards_glossary.pdf. 14. This does not mean national export control obligations, but rather relevant provisions of the IAEA statute and criteria approved by the board in IAEA document GOV/2010/67. An internal IAEA Secretariat historical note of February 29, 2012, on the IAEA fuel bank said the secretariat would interpret any supplier-state conditions on the provision of LEU to the agency for the fuel bank in accordance with the IAEA statute, meaning that the LEU would be made available to any eligible member state as determined by the director-general in accordance with the agency’s criteria as established by the board in GOV/2010/67. 15. 2010 IAEA assurance of supply establishment document. 16. The fixing of the tails assay is an economic compromise that balances the unit costs of feed material against the unit costs of separative work. If feed is cheap and separative work is expensive (for example, if the cost of electricity is high), then a relatively high tails assay is advisable. As the price of natural uranium rises and enrichment processes become more energy efficient, the appropriate tails assay should drop to lower values. 17. See, for example, the publications Ux Weekly, NuclearFuel, and Nuclear Market Review. 18. 2010 IAEA assurance of supply establishment document, para. 17. 19. U.S. Government Accountability Office, “Nuclear Nonproliferation: IAEA Has Made Progress in Implementing Critical Programs but Continues to Face Challenges,” GAO-13-139, May 2013, http://www.gao.gov/assets/660/654714.pdf. 20. International Commercial Terms consist of a series of predefined commercial terms that are widely used in international commercial transactions or procurement processes. They deal with costs and risks associated with the transportation and delivery of goods. See International Chamber of Commerce, “The Incoterms Rules,” n.d., http://www.iccwbo.org/products-and-services/trade-facilitation/incoterms-2010/the-incoterms-rules/. 22. U.S. Department of Energy, “Notice of Availability: American Assured Fuel Supply,” 76 Fed. Reg. 160 (August 18, 2011), p. 51357. Tariq Rauf is director of the Disarmament, Arms Control and Non-Proliferation Programme at the Stockholm International Peace Research Institute. He was head of verification and security policy coordination at the International Atomic Energy Agency, reporting to the director-general, from 2002 to 2011. He was coordinator for the agency’s activities dealing with its planned fuel bank and other fuel-supply assurances from 2003 to 2012. The views expressed in this article are those of the author.